On Sale Now! Free Shipping Included! Save 3% on the Ableware 738000001 Bend Aid Deluxe Hip Kit by Maddak Inc. at Get Cheap Health Insurance. MPN: 738000001. Hurry! Limited time offer. Offer valid only while supplies last. Ideal for anyone recovering from hip, knee or back surgery. Includes the most popular assistive devices for independent dressing and bathing. Ideal for anyone recovering from hip, knee or back surgery. Includes the most popular assistive devices for independent dressing and bathing. 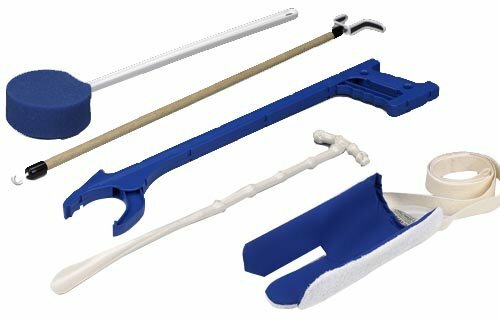 Includes: Aluminum Reacher Combination Dressing Stick & Shoehorn Scrubbies Round Sponge with Long Handle Deluxe Sock & Stocking Aid 2 pairs of Perma-Ty Elastic Shoe Laces - white, 30" and black, 24"